The plates that make up the Earth’s crust are continually moving at around 2-3cm per year. The distribution of the continents today is very different to what they were millions of years ago. This is because the plates have moved as the result of convection currents in the mantle. Tectonic plates ‘float’ on the magma beneath them in the mantle. 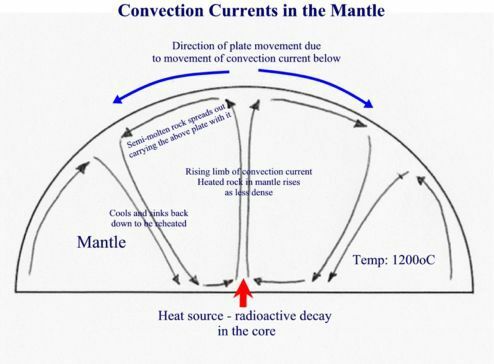 Convection currents, that occur within the molten rock in the mantle, act like a conveyor belt for the plates. Tectonic plates move in different directions. The direction of movement and type of plate margin is determined by which way the convection currents are flowing. The heat from the core is transferred to the mantle. Liquid rock, close to the core, is heated and rises. When it reaches the crust it is forced sideways as often it can not pass through the crust. The friction between the convection current and the crust causes the tectonic plate to move. The liquid rock then sinks back towards the core as it cools. The process then repeats.